Reeves Rehabilitation Center helps those who were injured or recently recovering from surgery to be able to get them functioning again and living their life. They are not only the leader in Stroke and Neuromuscular Rehab in San Antonio, but also have specialized programs for hand therapies and vestibular physical therapy. We knew an Adwords campaign with a highly targeted audience and keyword strategy would be needed to provide a consistent stream of leads for new patients because of the specific nature of these therapies. No campaign is complete with a great call-to-action that directs visitors to the next desired step. Whether that’s a phone call, an SMS message, or a form submission, you need something that is able to be tracked. Being able to track these conversions allow us to determine if the campaign is succeeding in its ultimate goal. 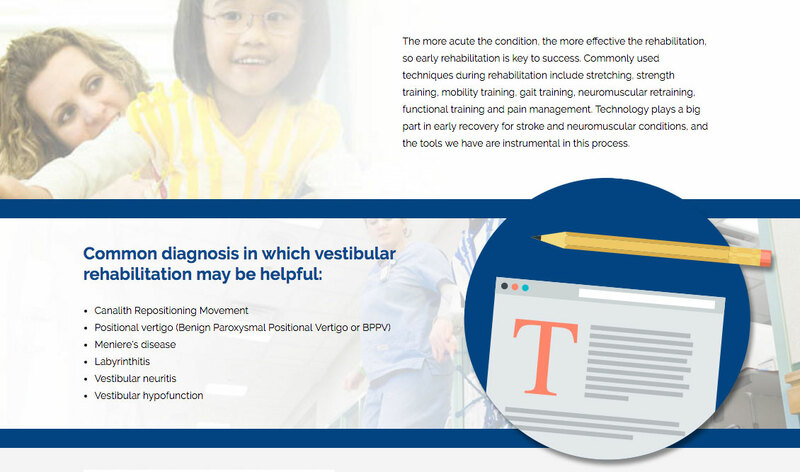 We crafted three landing pages to address each of the key focuses of rehabilitation with helpful and keyword-specific content to tie into each Adwords campaign we created. Each landing page has thoughtfully organized content optimized to rank well with each custom Adwords campaign. We enjoyed the opportunity to work closely with the University Health System team and doctors, especially when making sense of words like vestibular! With their team and ours bringing our expertise to the project we ensure accuracy, clarity, and success. With this type of collaborative approach, we could use our expertise in optimizing the content while keeping it informative and on-point. 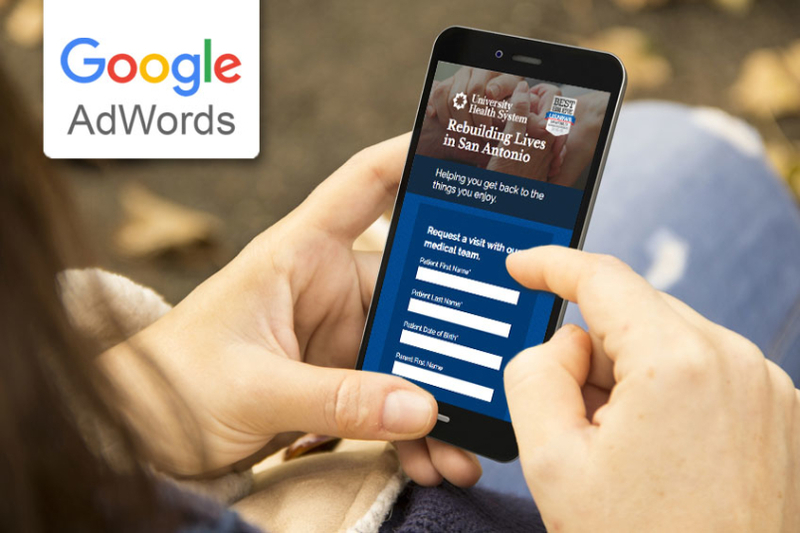 The Google Adwords campaign focused on individuals who were actively searching for our custom list of keywords related to each type of therapy. That’s what makes Adwords campaigns so targeted. It allows your ad to be shown to an audience who is searching for information closely related to your own content. This is perfect because you don’t have to convince them quite as much since they are already searching for an answer to their question or problem. Secondly, the location of this audience can be targeted. We kept it very specific. Even though it’s a bit meticulous, we like to target specific zip codes as opposed to targeting a city which can be more general. That way we are able to continue to optimize the campaign to the most responsive zip codes. We also continually use keyword planner and the search terms reports to get fresh keyword ideas. Early in the campaign, our initial efforts resulted in a lifetime average position of 1.5! As we continue to optimize the campaign keywords and audience targeting, that number should continue to go down a bit. After the first two-weeks of launching the campaign, the overall conversion rate was sitting nicely at 6.32%. With our conversion tracking that was set up, each dollar spent is accounted for which we bring to the client in our monthly report.